The High Season Internet Special is $249 per/night for 7 nights or more from December 17, 2018 to March 31, 2019. Under 7 nights - $269 a night. The Spring, Summer and Fall Special Pricing of $165/night is for 7 nights or more from April 1, 2019 to December 16, 2019. Under 7 nights - $185/night. Discounted Monthly Rates available....Just Ask! Cleaning Fee $125. Rates and fees posted are for two guests. $15/night extra person +$25 extra cleaning fee. Maximum 3 guests. If you want a flavor of what it is like to be a part of Hawaii instead of visiting Hawaii come and experience staying at the Kulakane. 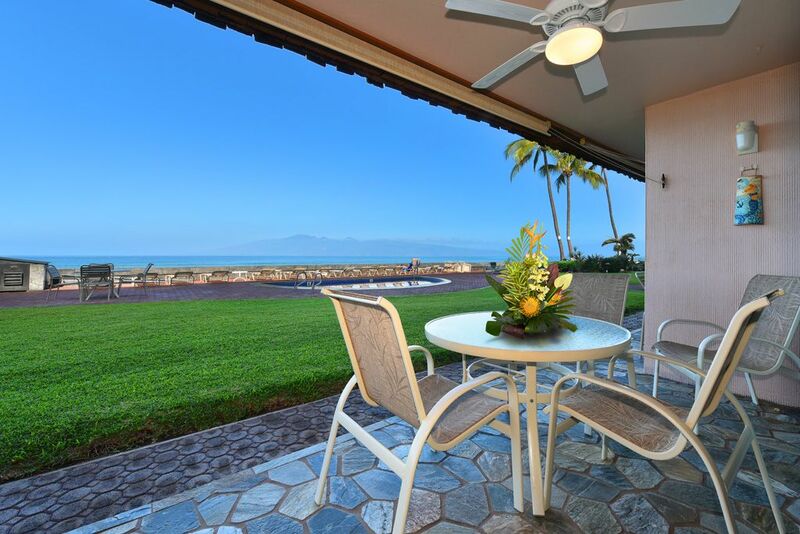 180 degree views from your lanai(patio)overlooking the ocean to the islands of Molokai and Lanaii where the sunsets every evening. Enjoy the relaxed atmosphere as you drink in this spectacular view. That spectacular view includes whales from December thru April that migrate here every year. You can snorkel and swim right off the beach 60 feet in front of the condo where there are several reefs. A family of turtles comes to feed at those reefs every morning and evening. If you watch closely you will see their heads pop up for air. Everything you could possibly want for your fun and convenience is within walking or short driving distance. Than includes golf, tennis, surfing, snorkeling, horseback riding, adventure trails, along with necessary conveniences such as eateries, coffee houses, doctors, grocery store, local markets and much more. The condo is equipped with a wonderful king size bed and comfortable hide-a-bed for sleeping. (see pictures) The kitchen has all the dishes, utensils, cooking ware that you could possibly need. Beach towels, bedding, and a digital safe in your closet. We have ceiling fans on the lanaii, in the living room and the bedroom. We hope that you will come share our 'home away from home'. Once you come to visit you will return again and again..
We have Free PRIVATE wireless. This is a non-smoking unit. Retired. My wife and I lived in the unit full time for 6 years. Great location, great sunsets, small, quiet complex, easy access to unit (first floor...steps from parking lot to front door), steps to ocean and swimming pool. No smoking except in designated smoking areas on property, FREE Private WI-FI in the unit. Close to shopping, activities and great restaurants without the hassle of being in a conjested hotel area. Farmers Market 1/4 mile from the unit. Well maintained, quiet complex, enjoy having meals on the lanai watching the whales in the winter, great sunsets every night, easy access to snorkling and swimming and relaxing by the pool! 50' from lanai to the Pacific Ocean! You will be in the FRONT ROW! Simply the BEST OCEANFRONT value for the Dollar! John and Leslie are fabulous hosts who have a fabulous condo for a quiet and relaxing getaway. The location was ideal for walking to great beaches (Kaanapali, Black Rock) or a within a short drive to many other amazing snorkelling spots (Kapalua, Napili, Honolua). We also enjoyed spending time at Whaler’s Village (great patios) and Lahaina (art walk) with its many great restaurants. One of our favourite times was simply spent relaxing on the patio while watching Humpback whales and sea turtles. It was such a perfect fit for what we were looking for on our vacation in Maui. Thank you!! Kirby - thanks for kind comments. We look forward to having you stay again. We enjoyed our stay very much. It's hard to beat sitting on the lanai watching whales! Yes we were lucky to hit whale season. The property was very well equipped with everything you need. We were very comfortable. Thank you! We really loved staying in this condo. The views are amazing and the whale watching was over the top. The condo was fully stocked and very comfortable. We stayed in John’s studio for 8 days while celebrating our 5 year anniversary and it was truly special. We loved watching turtles and whales. The well-stocked kitchen made cooking meals a breeze and we loved being able to walk to the farmer’s market. John went above and beyond to make sure we had a pleasant stay. There really is everything you need here- we even completed a puzzle on an atypical rainy day. Thank you John for making us feel like family. We’d love to come back and stay here again! We vacation in Maui every year, 1st time at the Kulakane. So happy with the Condo and the complex that we booked again for next year! The Condo has a warm comfortable feel, was clean and had all we needed. The location is great and the view incredible! Thanks John for providing us with your great unit! How beautiful!! From the first interaction we had with John! To the welcoming champagne for our honeymoon ❤️ The condo was fully stocked! Just bring your clothes and food :) the location can not be beat! Ocean and pool front! Saw the family of turtles daily :) walking distance to shopping, farmers market, food trucks, dining! Literally everything you need. Short 5 - 10 minute drive to Lahaina for all the shopping and additional dining! Even more beautiful beaches nearby :) we can watch the sun set from our balcony every evening. the people in the complex are so nice and it just feels like home. I can’t wait to come back again and I haven’t even left! Haha. This place is wonderful . Our own piece of paradise. If you’re looking for a vacation amongst friends and locals and authentic Maui, this is it! Thanks Angelina for your kid comments. We look forward to you coming back again soon. Cleaning Fee $125 add $25/person over 2 occupants. Will be added at the time of reservation. Extra Person Fee of $10/night per person for over 2 occupants. Will be added at the time of reservation.